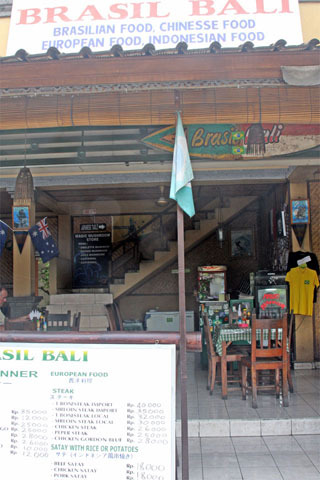 Kuta has something for most budgets eating wise, from streetside shacks to quite smart air-con restaurants. Prices tend to be a little higher than elsewhere on the island. The atmosphere inside is very relaxed and despite the clientele being slightly different these days, they give this place a chilled out feel with flowing dresses and flowers in the hair. Perhaps it’s the same people as before, but they now have better jobs. 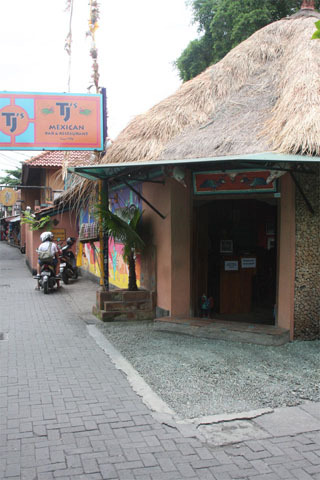 The fact that this place has survived since 1984 is a testament to the quality of the food and the pleasant experience people enjoy here.... Read our full review of TJ's. Well, no need to look any further than Mojo’s Flying Burritos as an order of one of their enchiladas will provide you with enough cheese to last months. In fact, if you’re a long-term traveller and haven’t eaten cheese in a while, diving straight into this amount of dairy could wreak havoc with your system. Ahem. Quesadillas and burritos also feature on the menu and aren’t as cheesy but are... Read our full review of Mojo's Flying Burritos. The result is Stakz which sells burgers, pasta, sandwiches and juices in a style that Westerners are comfortable with — not some dodgy take on spaghetti or the use of sweet Asian bread. They make a point of stating that their produce is fresh and that their meals are cooked to order. At the time of writing the cafe was yet to install a proper espresso... Read our full review of Stakz. During breakfast and lunch, bottomless coffee and tea is complimentary and it’s a great way to sit back and relax while surfing on the free WiFi. Be warned that the small pizzas are massive and too big for the average human. If all you want for breakfast is a fruit salad, coffee and a play on the internet, you can’t go wrong for 15,000... Read our full review of Havana Club. 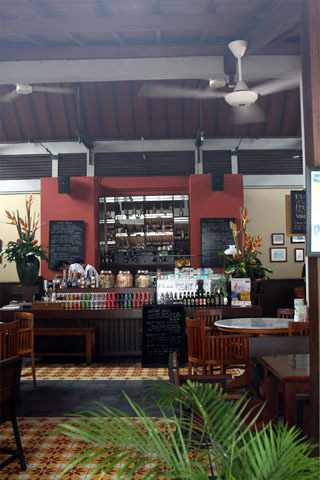 While the flavours are distinctly Indonesian, the setting is definitely very Westernised making it a comfortable place to sit back and sip a fantastic cocktail and feast on some top-notch Indonesian delights. The staff are courteous and professional, but you’d expect that at this sort of place — part upmarket café, part restaurant. 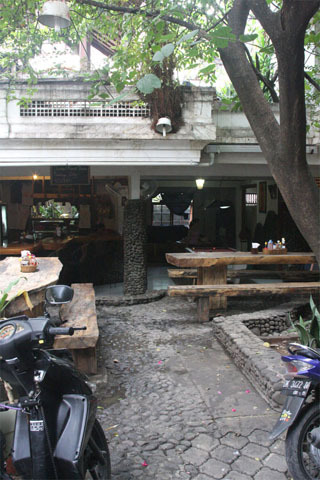 Prices are high compared to the surrounding... Read our full review of Kafe Batan Waru. 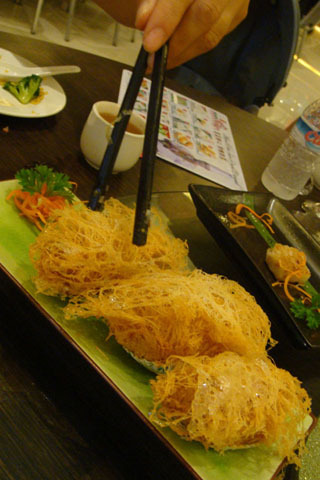 Choose from among a wide-range of dim sum classics, though the emphasis is on seafood. Photos on the menu mean you’ll most likely be pointing and picking among all the dishes, which also include barbecue and hotpot specials. Sundays seem to be family days — or at least when we went on a Sunday with our gang a clown was making balloon animals and the din was a perfect cover for, well, taking... Read our full review of Feyloon. 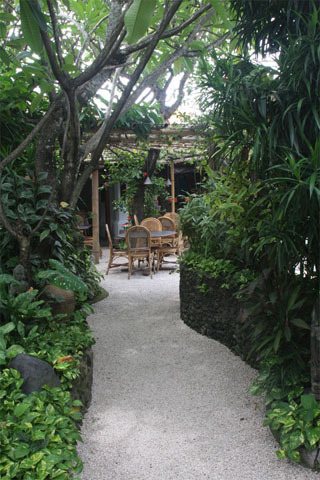 The mix of Western and Indonesian food here is delicious and the lush garden surrounds are enchanting, especially at night. It’s been running since 1973 when Kuta was still a rural backwater, people stayed in Denpasar and commuted to the beach. 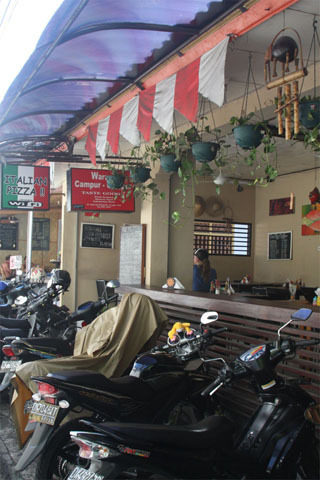 Poppies Lane was named after the restaurant and it’s a Kuta... Read our full review of Poppies. The menu is littered with fried options that kids are bound to love and expensive seafood options that parents might elect to indulge in. The atmosphere is very much like a Hard Rock Café with over the top service, uniforms and menu, but that’s this style of family dining for you. Prices are a little on the high side. 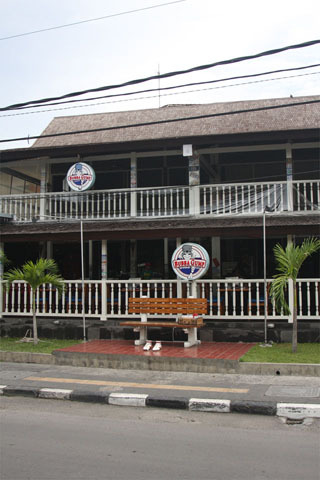 It’s a smart, two level escape from the Kuta... Read our full review of Bubba Gump Shrimp Co.. In fact, if British food is your thing, you may well think you’ve died and gone to heaven as there is meat and beer in abundance and plenty of sandwiches served on white bread. What more could one want from a casual pub located right in the heart of an Asian... Read our full review of Alleycats. The menu consists mainly of tourist favourites such as pizzas, pastas and burgers, but also has a wide range of local dishes as well. Of particular note are the different ways you can have your special (hallucinogenic) mushrooms cooked up — watch out, as the effects can be stronger and longer-lasting than anticipated — handle with... Read our full review of Warung Brasil. The real reason to come here is for the cheap pizzas, burgers and free WiFi. The small pavilion is brightly lit and quite breezy due to its proximity on a small laneway between Poppies I and II. They also serve Illy coffee, but haven’t got a good espresso machine so while the coffee is only slightly above average for Bali, if you’ve had your fill of coffee cowboy-style, try... Read our full review of Warung Campur-Campur. This place is nowhere near as busy as its brother down the road, so it might be worth a visit if Bamboo Corner is full. 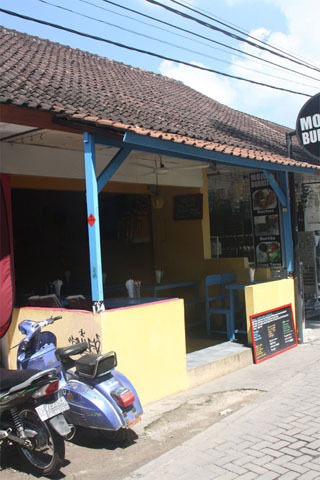 A nasi goreng will set you back 10,000 rupiah here and a pulped mango juice 8,000 rupiah. 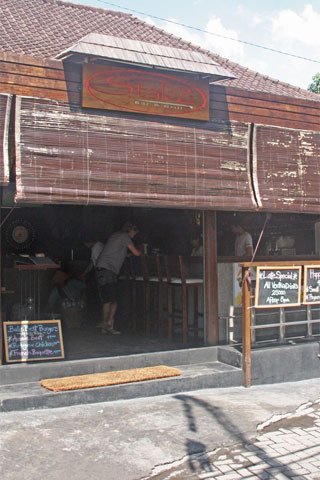 Cheaper food elsewhere in Kuta is only available at warungs and even then, the savings will only be in the order of a couple of thousand... Read our full review of Gong Corner. 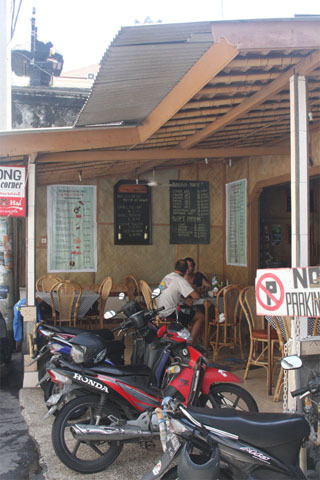 It is quite often impossible to get a seat and you’ll be forced to eat in off-peak times such as late afternoon or head around the corner to the similarly priced Gong Corner on Gang Bedugul. 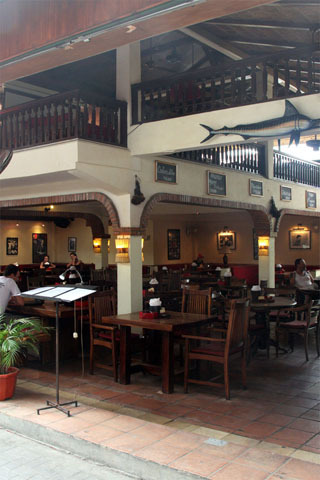 The food here is mainly Indonesian standards such as nasi goreng for 10,000 rupiah, but also a range of seafood options such as a whole snapper for 35,000 rupiah. If you can’t stomach any more rice, there are... Read our full review of Rumah Makan Bamboo Corner. A couple of fantastic juice stalls blend mangos, papayas, dragon fruits and a range of other exotic fruits and serve them in sealed take-away cups for those in a hurry. 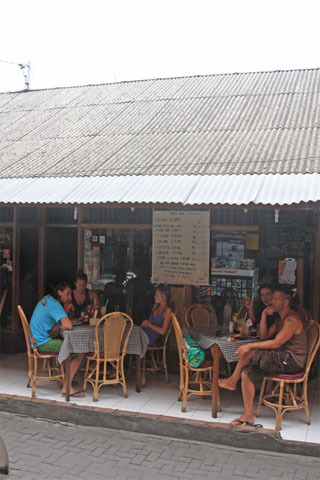 The juices are very tasty and start from 4,000 rupiah — a blended mango juice is 5,000 rupiah. 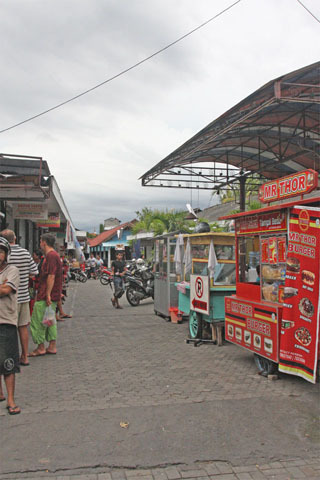 Other stalls sell cheap local food such as nasi campur and nasi goreng throughout the day. This market is very local, but has a... Read our full review of Pasar Pattimura Jaya.